world religion day in vietnam | doberman pizza. World Religion Day was celebrated in Vietnam every year between 1962 and 1975 inclusive, year after year becoming an increasingly more important observance in the religious life of Vietnam. Each year’s presentations explored different topics related to the oneness of religions and the place of religion in society: “Mankind must, and are able to achieve religious unity”; “Only religion can bring justice to the world”; “Religion must be the cause for unity of mankind”; “The purpose of religion is to establish unity and harmony”; “The mission of religion before current events”; and so on. 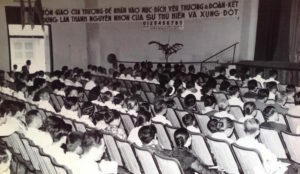 National celebrations were held in Saigon, but local observances quickly spread to other cities, such as Da Nang, Pleiku, Can Tho, Rach Gia, Phan Thiet, Phan Rang, and more. 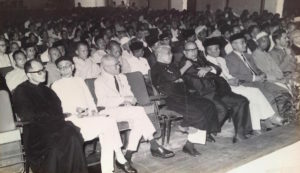 To give you an idea of how big these events were, the 1967 observance of World Religion Day in Saigon gathered an audience of 1,000 people. The annual event was given regular coverage and was widely reported in the English, French and Vietnamese media. In 1971, articles appeared in at least twenty different daily newspapers, including three front page top headlines; news was also carried by radio, television and newsreels. I believe that only religion, only the moral spirit, can build a better society. I am happy to see the various religions now having the opportunity to sit together in the spirit of solidarity. I wish that religions will have better opportunity for solidarity to build the country, and therefore I warmly praise the Organizing Committee of World Religion Day. I think that the Government should be aware of important endeavors like this one. It should declare World Religion Day a National Holiday in order that this event can be celebrated more solemnly; the speeches here should be propagated more widely for the people of North and South to see that we are making great efforts to build a truly beautiful society, where spiritual values are fully respected. I promise to bring this voice to the Assembly meeting for the people to be more informed. With files from Mr. Jamshed Fozdar, Mr. Nguyen Dinh Thoa, and Wikipedia. Photos courtesy of Mr. Le Loc. This entry was posted in asia chronicles, baha'i blog and tagged history, interfaith, religion, vietnam by danger. Bookmark the permalink.